The signing of the Convention on the Legal Status of the Caspian Sea in Kazakhstan's Aktau city is of great importance not only from a regional, but also from a global point of view as this created the conditions for ensuring stability and security in the Caspian Sea, Konstantin Kurylev, Associate Professor of the Department of Theory and History of International Relations of the Russian Peoples' Friendship University, said. 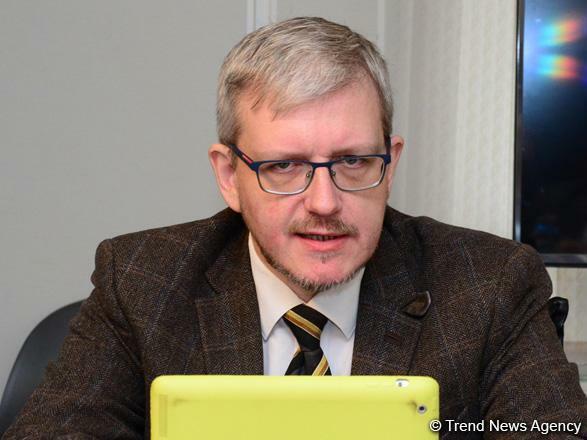 Kurylev made the remarks in Baku during a round table meeting dedicated to 'Security Problems of the South Caucasus and the Caspian region countries in the press center of Trend News Agency . 'At the same time, the signing of the document created conditions for the movement of ships in the coastal countries of the Caspian Sea and also increased the importance of the Baku-Tbilisi-Kars (BTK) route, he added. 'Earlier, there was a certain bias for the BTK. "From the point of view of environmental safety, on the basis of the signed Convention, coastal countries will be able to lay pipelines through the bottom of the Caspian Sea if this does not damage the marine ecology, Kurylev said. 'As for the economic and military significance of the document, there is such an opportunity for the implementation of new investment projects in the region. 'The agreement on all these spheres was primarily achieved because they created obvious advantages for the interested countries, he said. 'At the same time, the Convention does not solve a number of issues concerning the delimitation of the bottom of the Caspian Sea among the coastal countries. 'The bottom must be divided in accordance with the principles of the international law, Kurylev said. 'The additional agreements must be signed. Although Azerbaijan has bilateral agreements with Russia and Kazakhstan on the delimitation of the Caspian Sea, the lack of similar relations with Turkmenistan and Iran was an obvious problem for Baku. 'However, today the situation is a favourable, he added. 'The certain agreements have been reached with Ashgabat following the Azerbaijani president's recent visit to Turkmenistan. The possible implementation of options for the Trans-Caspian gas pipeline was discussed during the visit as Turkmenistan is interested in Azerbaijan's assistance in transportation of the Turkmen gas to Europe." 'The signing of the Convention will allow Azerbaijan to strengthen the international transit systems as an emerging segment in the future, Kurylev said. "The agreement enables to increase the international cargo transportation volumes, arouse interest in the Baku-Tbilisi-Kars transport corridor, he said. 'Signing of the Convention is very important for Baku not only from an economic point of view, but also from a political one. The further development of Azerbaijan's relations with Russia and Iran within and on the basis of this Convention, taking into account that Moscow and Tehran are Yerevan's important allies may further strengthen Azerbaijan's positions in the region." They also discussed signing of the 'Constitution of the Caspian Sea in the context of ensuring regional security in the South Caucasus, regional conflicts and security in the South Caucasus, the fight against terrorism in Azerbaijan, the deepening of economic ties between Azerbaijan and Russia in the light of the formation of a new technology structure in the global economy and economic security, as well as intensification of regional integration and the coordination of the actions of the Eurasian countries in removing tensions and preventing new challenges, the problem of mutual understanding of the North and South Caucasus as a common security system for border states.